When I was a teenager, I made mixtapes on cassettes using songs from the radio all the time. The best mixtapes had a consistent theme, cool artwork, and no radio advertisements or awkward pauses between songs. Unfortunately, cassettes have fallen out of popularity, but the concept of compiling your own mixtape is a truly modern creation that exists regardless of the medium. 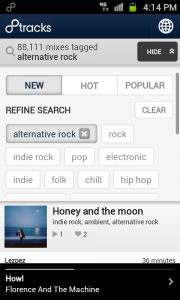 8tracks is an Internet radio site which puts an interesting spin on this concept. Users can create their own mixtapes using songs they upload or songs publicly available on SoundCloud, and then share those with the 8tracks community or with their friends. 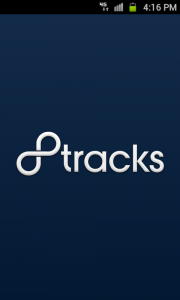 Recently, 8tracks released a free Android app for people to listen to mixtapes on the go. Let’s give it a go, shall we? On first run, the user is greeted with a standard login screen. Current 8tracks users (8tracks calls their users DJs) can enter their username or email along with their password, or you can log in using your Facebook account. Pressing the green Sign up button allows you to register for an 8tracks account and logs you into using the app. 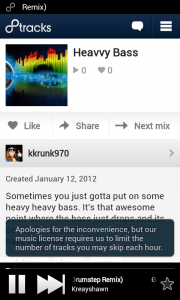 However, you don’t have to be an 8tracks DJ to enjoy the application. Just press the Take me to the music button and you’ll go directly to the app’s home screen. The home screen for the 8tracks app defaults to the All tab. On this tab, you can scroll through the latest mixtapes which have been created by other 8tracks DJs. Each mixtape is located on its own row, and tapping the row sends you to that particular mixtape’s page and immediately begins playing. On the mixtape’s page, you can like the mixtape, share it using any of your native Android sharing options, visit the profile page of the mixtape’s DJ, or navigate to the next mixtape. You can also tap any of the tags listed for the mixtape, and the app will pull up other mixtapes which use that same tag. I did notice that when you tap the “Next mix” button, it doesn’t go to the next mixtape from the list of latest mixtapes created; it just goes to a random mixtape. The other tabs in the 8tracks app are titled Home and Liked. The Home tab includes the recent mixtapes from other DJs you have added as friends, and the Liked tab includes mixtapes which you have liked. 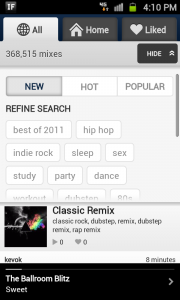 On both tabs, you can also refine your search based on the tags included in the mixtapes. This could be useful if you have several dozen followers or mixtapes you have liked. This search feature exists on the Home tab as well, and is perhaps the most powerful feature of the app. You can drill down and find very specific mixtapes based on just a few tags. You can also search by artist or description by using the Search page located under the app’s menu options (Menu button -> Search). 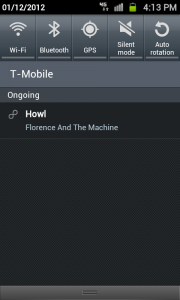 The settings for the 8tracks app are hidden in the second level of menu options (Menu button -> More -> Settings). Unfortunately, once you access the Settings page, there’s only one setting — the option to clear your search history. You can also view the app’s changelog from this page, but any other options must be done on the 8tracks website. 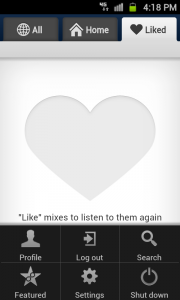 The lack of settings for the 8tracks app is the first of many drawbacks. 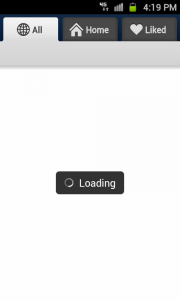 I found that navigating between the app’s tabs took at least 5-10 seconds on a strong 4G connection (I’m using the Samsung Galaxy S II). 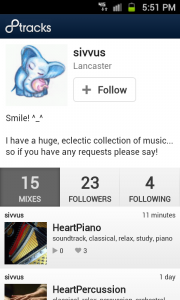 If you create your 8tracks account via the app, you have no way of editing your profile unless you visit the 8tracks website. You also don’t have the option of changing the app’s home screen for the app to a different tab; it seems odd to have a Home tab that’s not the actual home screen for the app. The 8tracks app’s main feature is listening to other DJ’s mixtapes; however, most mixtapes cut off abruptly after 30-60 seconds of no activity, forcing you to navigate back to the home screen of the app in order to resume playing (and even then, it skips to the next song in the mixtape). You only have the option of skipping forward through a mixtape, so you can’t replay songs or move backwards to listen to other songs. There is also a limit of skipping only three songs per hour regardless of how many mixtapes you play. These are probably legal limits which 8tracks can’t circumvent (similar to Pandora), but it’s not very clear to the user until they try to skip through songs. Another big drawback about the 8tracks app is that mixtapes cannot be created directly from the app. 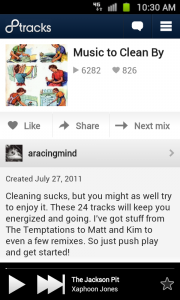 There is also no automatic scrobbling to Last.fm of songs that are played. 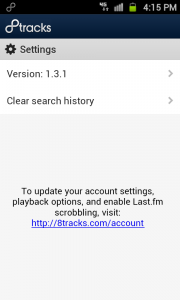 You can set up Last.fm scrobbling on the 8tracks website, but it’s surprising that the app doesn’t scrobble songs based on whether you have the Last.fm app installed on your Android device (most music apps on Android do this by default). Hopefully these issues will be fixed in future versions of the app. The 8tracks app is an admirable attempt at listening to sharing mixtapes from the 8tracks community, but the issues with playback and lack of settings makes the listening experience more frustrating than rewarding. In future versions, I would like to see better playback controls, native scrobbling, and options for customizing your profile. 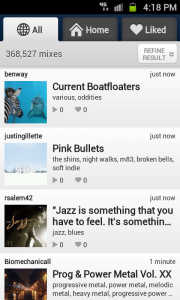 8tracks is free on the Android Market and requires Android OS v2.1 or higher to run. 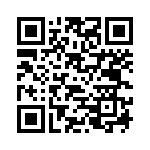 Download the app from the Market link below or by using the QR code provided to the right.